Weisbrod is currently a partner with the real estate consulting firm HR&A and has a long history in the city’s real estate scene, dating back many mayors. Weisbrod was born and raised in New York City, and, according to the New York Times, upon graduating from NYU Law School, he started advocating on behalf of the city’s squatters and families in welfare hotels. Under Mayor Ed Koch, Weisbrod is widely credited for successfully cleaning up Times Square in the 1970s. In 1991, Weisbrod became the founding president of the New York City Economic Development Corporation—and in 1995 he held the same title at the Alliance for Downtown New York. In the latter role, Weisbrod was tasked with transforming Downtown Manhattan into a mixed-use neighborhood. 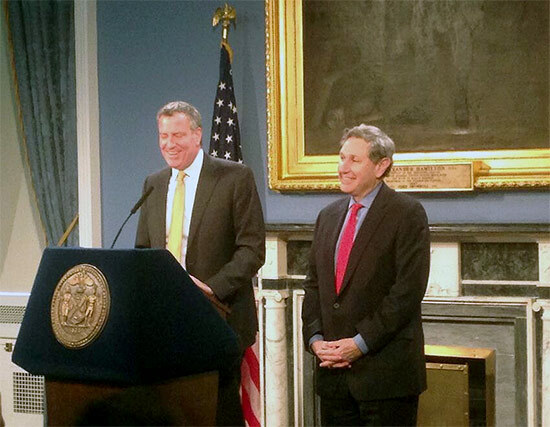 De Blasio said Weisbrod “led the way” in revitalizing the neighborhood after September 11th. Before joining HR&A in 2011, Weisbrod spent five years as the president of the real estate division for Trinity Church—an organization which oversees six million square feet of property. All of this experience—and this is an abbreviated resume—will be critical as Weisbrod steps into an exceptionally complex role in determining the future of New York City. There will be many challenges ahead—from the redevelopment of the Domino Sugar Factory to the possible re-zoning of Midtown East, to creating a more storm-resistance city, to micro-apartments—all of which will fall within de Blasio’s ambitious push to create more affordable housing. At the press conference, de Blasio said that his administration would look at projects like Midtown East Rezoning and a proposed Major League Soccer stadium in the Bronx “with fresh eyes.” The mayor added that he is approaching development projects like these with “an entirely different set of goals” than his predecessor, Michael Bloomberg.